What a lucky find for a three-day weekend: Hulu has a handful of Hindi films! Today I watched 13 B, a thriller stretching across three seemingly unconnected families. I scare easily, and for me this was an effective film...after the first hour. It starts very slowly, with many unnecessary, slow realizations and repeated clips for emphasis of important occurrences or thoughts. Central character Manohar (Madhavan) takes a loooooong time to realize there's some freaky sh*t happening in the new apartment that he lives in with his wife (Neetu Chandra), mother (Poonam Dhillon), sister, and brother's family..longer than his blind neighbor and his seeing eye dog. Yeah. But once Manohar understands that something bad is going on, the movie really picks up, and I enjoyed it very much. 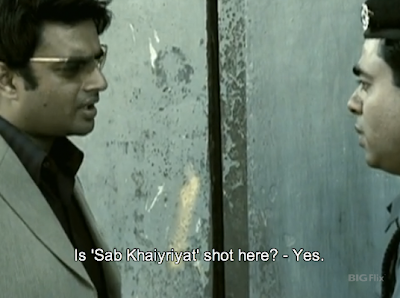 It was not so scary that I had to hide under a blanket, but it made me more tense than Karthik Calling Karthik simply due to the violence, which is not vast but is prominently implied and discussed in certain scenes. We do not see any characters meet horrible ends, but we hear about it, and I even said "oh god" to the screen in response to one of these descriptions. The scariest part of the film for me was the plotting and portrayal of a mentally ill character (Deepak Dobriyal, I think) - completely unnerving. 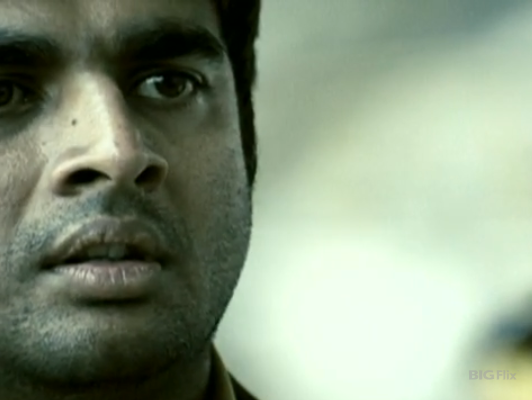 Madhavan is solid (and handsome as ever) as the kindly but freaked-out protagonist who's the only one in his eight-person house who understands what danger is lurking. Side note on that, by the way: it is the three grown women of the house who are presented earliest and most frequently with the evidence of the big mystery, but they never catch on. What's up with that? Are they supposed to be stupid? Or just brainwashed by the way the evidence is presented? Despite all the bad things in this story happening in one apartment (the titular 13 B), none of the people who live there except Manohar really seem to notice or question them. Anyway. 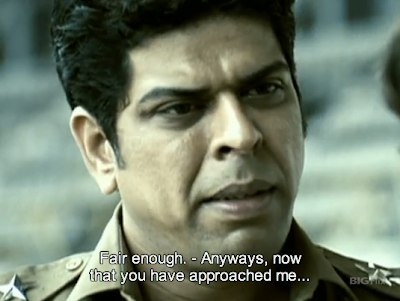 Murli Sharma has the next meatiest role, playing police inspector Shiva, Manohar's conveniently-employed friend. 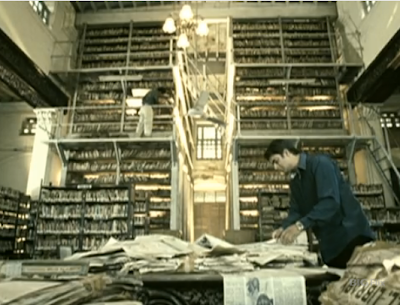 Shiva does not appear until later in the film and fortunately his participation matches its quicker pace, not only helping Manohar try to solve the mystery but also providing him with a much-needed sounding board and fellow witness to the kinds of events that would make most people think they're crazy. What a wonderfully nightmarish archive! And am I crazy, or does the newspaper in the lower right corner actually say "LIBRARY"? and shot compositions are a little different here and there. Quite a few scenes show only part of people's faces, maybe as a way of underscoring that the characters (and we viewers) don't yet have the complete picture of the story. There's a scene with Manohar and Shiva interviewing an expert on the paranormal that had me shivering: the camera gently but relentlessly swung back and forth behind the two as they faced their interviewee, always behind them and nominally looking at their subject but also shifting so much that I couldn't help but wonder if it was actually pointing towards something else. It was as though we had slipped into an unseen character's point of view, and in a horror film, the idea of an unseen character is a potent wrinkle. 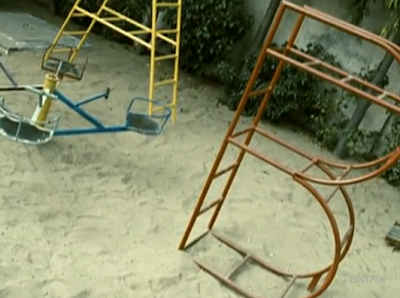 There were also several neat little allusions to the film's title. Blood spilled early in the film forms a "13" (which, if you put the two numbers close enough together, also looks like a B), 13:00 proves to be a dangerous time, the tv freezes on channel 13, and the helpful neighbor dog digs frantically at a spot next to this playground equipment outside the apartment building. For me, all of these things worked together to make an entertaining and creepy evening. I can easily understand people not making it through the first hour or so; if you're up for some non-challenging fun or are dead set on seeing anything that qualifies as suspenseful, then I recommend it - and hope you'll email me after you see it so we can discuss the inappropriateness of the film's tag line ("fear has a new address") and whether or not I should have seen the ending coming. Warning: if you go looking for information about this film, the Wikipedia article is spoiler-iffic. I used to like and watch lots of scary films but not anymore (guess tastes change with age) and 13B was just the right dose of frightening and interesting. I liked this film a lot. Another Indian horror film I really liked was Phoonk. have to watch it, but am going to leave all the lights on!